Beaches are often considered the most romantic places to head to when it comes to romance or honeymoon. India, with its fair share of tropical islands and coasts is home to several beaches and in this post we will talk about the best beaches in India for honeymoon. What is it that makes beaches such sought after destinations to plan honeymoon? From the lap of beachfront luxury to the thrill of adventure under sea or just the privacy by the vast sandy expanse of sea with sun over the horizon painting it red, golden and yellow, the allure of beaches invariably invokes the inherent romance and stoke the passion of the lovers. Reason enough, we'd say, that you should also plan your honeymoon at one of the romantic beaches on the planet. Earlier, we had covered the most romantic islands in the world. Later we also covered the most beautiful islands of the world. Awarded as ‘Asia’s best beach’ by TIME Magazine in 2004, Radhanagar Beach is undoubtedly one of the most beautiful and tranquil Indian beaches. 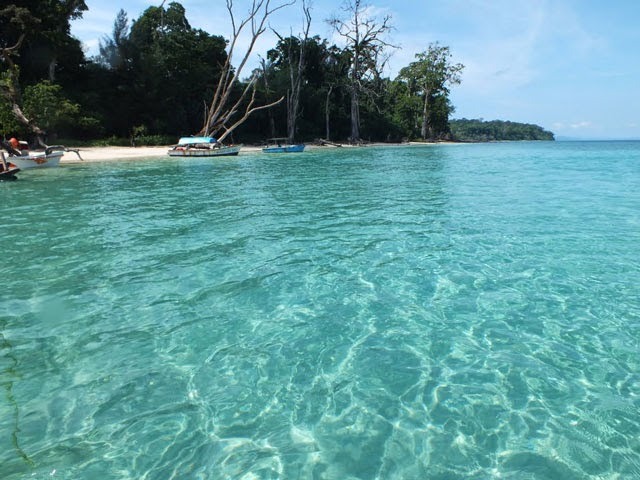 Around 12 km from the ferry pier of Havelock Island, this beach has turquoise blue waters and clean white sand. For the romantic souls, there is seclusion. If you wish to indulge in water activities, you can partake in snorkeling, scuba diving, swimming, game fishing and more. Both of you can also enjoy a leisure walk, sunbathing while whispering sweet nothings into each other’s ears. Beach No. 7 on the western coast, it is away from city life adulterations. Summarizing the romantic feel of Goa at its best, Agonda beach is scenic, wide, heavenly and serene, making it ideal for a honeymooning couple. Although it is a beach with high tides and is not safe for swimming, but you can enjoy beautiful sunset views, leisure walks and long lazy days along the sandy expanse. There is not much of tourist activity here and so it is ideal for a newly-wedded couple but if you want, you can enjoy boat trips. Actually the main attraction of this beach is that you do not have to do anything, you can simply lie down and relax, admiring the scenery spread all around. As hawkers are not allowed on this beach stretch of 3 km, you can remain undisturbed. There are beach shacks nearby where you can relish tasty food and drinks. Known for its untainted beauty, Varkala beach in Kerala is a peaceful alternative for a honeymooning couple to the otherwise other busy beaches of Kerala. 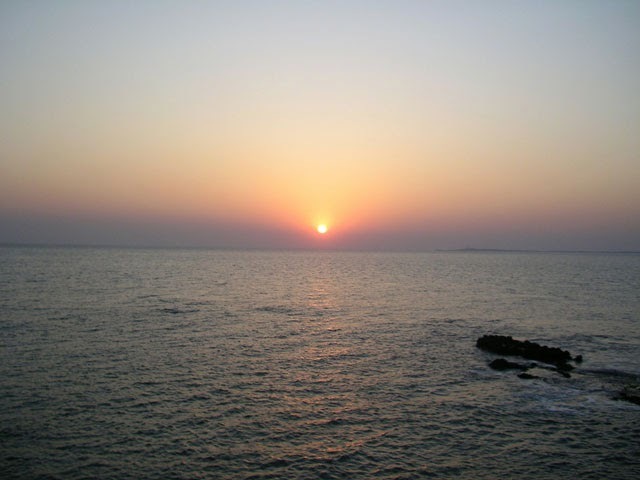 Its picturesque setting with cliff stretches and amazing views of the vast Arabian Sea prove to be the major highlight. The paved footpath along the cliff lined by small shops, coconut palms and beach shacks is a nice to enjoy a walk, holding hands. Also known as Papanasam beach, it has also been termed as one of 10 top seasonal beaches in the world by Discovery channel. Identifiable by black sand, Varkala beach is perfect for swimming, sun-bathing, viewing sunset from the cliff-top and enjoying Ayurveda massages. Couples can also partake in sightseeing of the nearby attractions including Ponnumthumut Island or rent a bike for exploring the nearby villages that are not spoilt by tourism or a dreamy boat ride on the placid waters of Kapil Lake. Counted as one of the most popular beaches in Goa, Candolim beach in North Goa enjoys a nice location of being close to Baga, Calangute and Aguada beaches. A relatively quiet serene beach, it attracts with its swaying palm trees, calm sea waters, sand dunes and cleanliness. There is no dearth of happening spots, tasty food and other tourist attractions, as they are placed quite nearby. 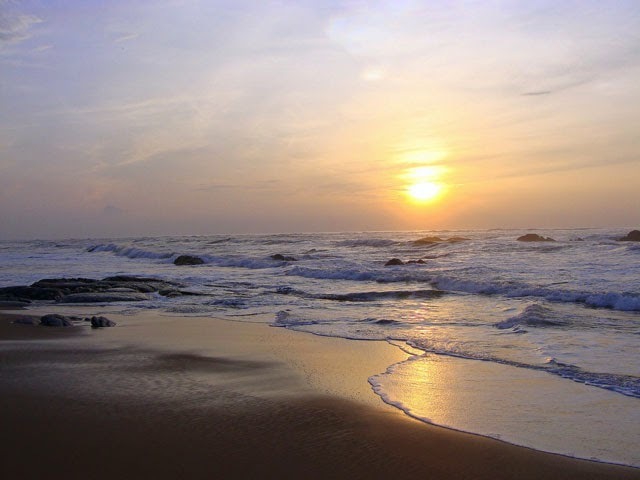 Owing to its tranquil and soothing surroundings, Candolim beach is ideal for you to spend some nice moments in intimacy. The beach offers ample opportunities for water sports such as parasailing and water skiing. Elephanta Beach, around 30 minutes away by a boat ride from the Havelock Jetty, is a haven for snorkeling and scuba diving enthusiasts, offering them an amazing chance to indulge in their favorite activity. Famed for its rich marine life and striking corals, Elephanta beach is just perfect for those newly-wedded couples who have an adventurous streak in them. 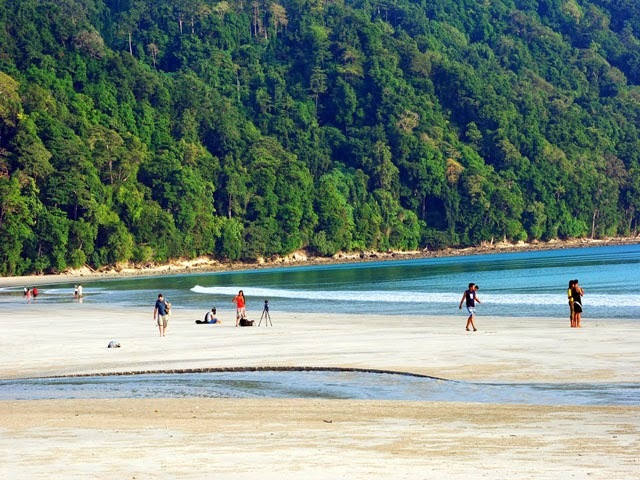 Even human activity has not affected the scenery of this beautiful beach. Lying northwards of the well-known Radhanagar Beach, Elephanta beach is away from any regular tourist activity. One of the major attractions here is glass-bottom boat ride. Placed quite close to the main Vishakhapatnam city, Yarada beach is a stunning beach which is not much popular amidst tourists. With its little tourist as well as local activity, it offers you an ideal location to know each other better on your honeymoon. A secluded environment and stunning sunset views prove to be quiet magical. Take entry from the Yarada Beach and treat your eyes to the clean sea waters, golden sand and lush greenery. Not ideal for swimming, it has a number of eateries nearby serving lip-smacking local food. Encircled by rocky hills from three sides, Yarada beach is a completely pleasing landscape, away from regular tourist chaos. 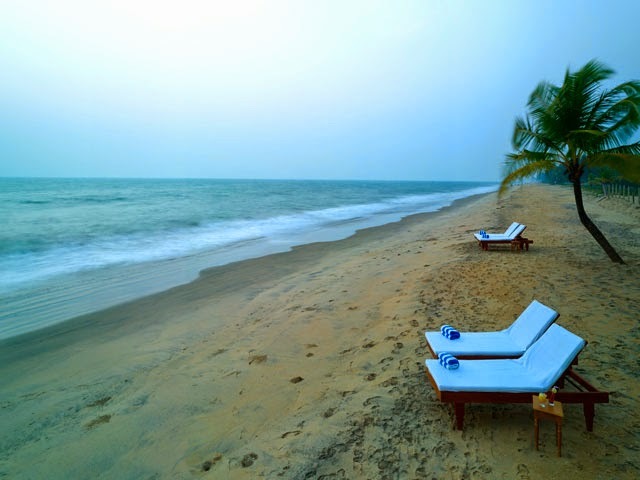 Lying in the sleepy fishermen village of Kerala Mararukulam, Marari beach is not a typical tourist beach that bustles with activity all round the year, making it an ideal location for a honeymooning couple. One of Kerala’s lesser-known beaches, this beautiful beach offers you a chance to relax and enjoy some private moment with your better-half. Although not recommended for swimming, you can definitely plan a number of day-trips such as visit to the coir-making units, bird watching at the Kumarakom Bird Sanctuary or a romantic houseboat boat rides on the tranquil waters of the Kerala backwaters. The beauty of it is that you can even plan your honeymoon in Kerala during monsoon. No wonder Kerala is considered one of the most evergreen tourist destinations in India which could be visited round the year. If you are visiting this deserted spot with white sands and lush coconut palm trees during August, do not miss the Snake Boat Races, held every year. 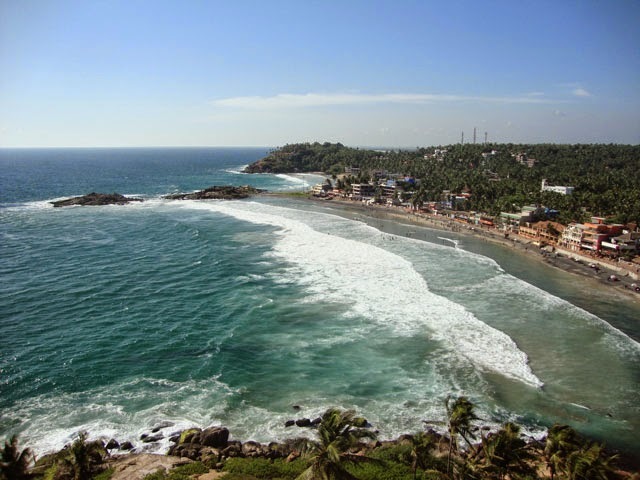 Kovalam in Kerala is one of the most popular beach destinations in India for honeymoon. 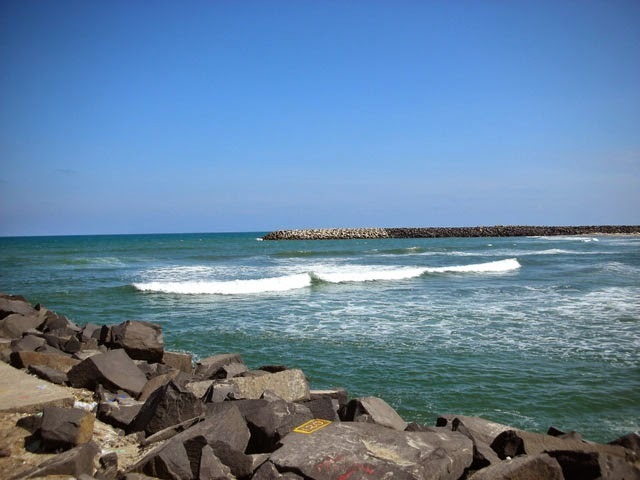 Getting its name from the old Vizhinjam Lighthouse placed nearby, Lighthouse Beach is one of the most popular out of the three Kovalam beaches. The southernmost crescent-shaped beach, it has an inherent unearthly magic to itself. During your visit to the Lighthouse Beach, do not miss visiting the closely placed Hawah Beach and Samudra Beach. Though one of the most famous beaches amidst the tourists, but its pristine beauty and nearby attractions make it a must visit. Climb up to the 30 meters red and white lighthouse and treat your eyes to the lush palm grooves, sprinkled all around. If you have an adventurous streak in you, partake in surfing, swimming, paragliding and para sailing. Have an Ayurvedic massage, if you wish to relax. 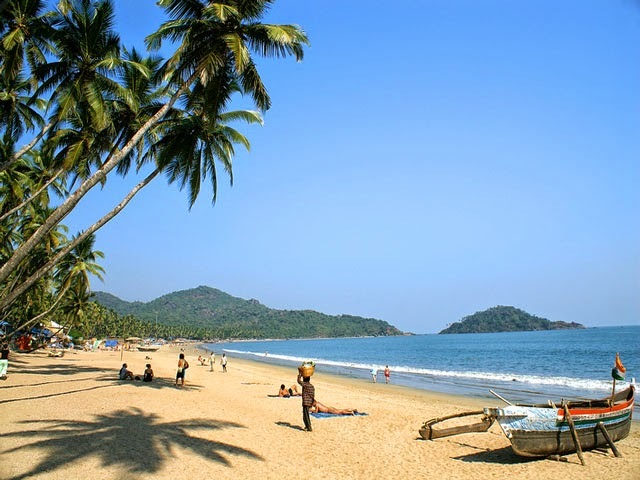 Surrounded by thick coconut palm grooves, Palolem beach is one of the most striking beaches in South Goa. Semi-circular in shape, this tranquil beach is around a mile in length. 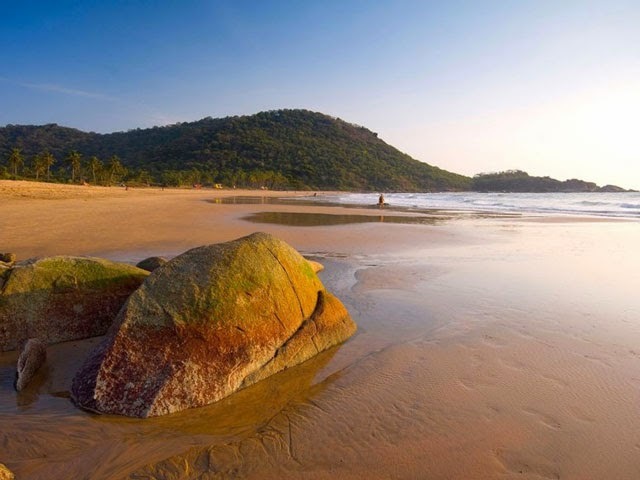 One of Goa’s lesser known beaches, Palolem still is a clean beach that has little tourist activity, perfect for you and your partner to enjoy long walks, hand-in-hand. The beach also offers a number of activities to indulge in. you can hire a boat for fishing or can opt for a dolphin spotting trip. Kayaking is another interesting alternative, if you both wish to try. Shop for jewelry and souvenirs at the nearby shops, gorge in fresh seafood dishes or simply plan a trip to Cotigao Wildlife Sanctuary. 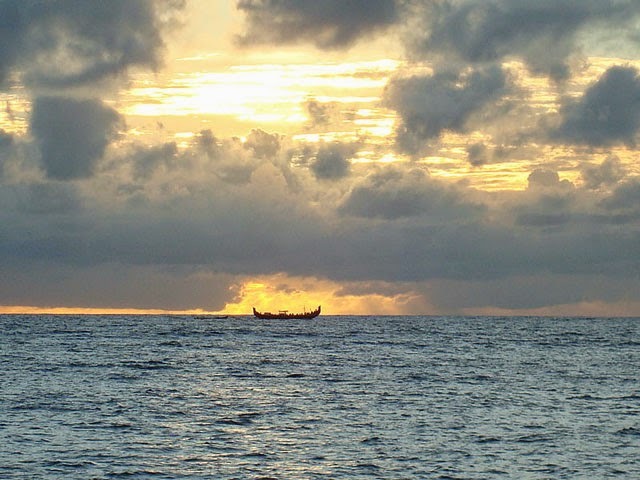 Located around 3 km northwards of Nani Daman, Devka Beach is a laid-back and serene beach. Have a leisure walk on white sand while the crystal-clear cool sea waves touch your feet slowly; collect shells and colorful stones, if you wish to. In case, you like to swim, be careful of the rocky formations at the surface. You can also visit the beachside amusement park, which is just a stone’s throw away. Some of the major attractions include camel and pony ride, colorful musical fountains, beautiful walkways, various eateries, shops and more. For newly married couples who are seeking love and privacy, Pondicherry, also known as Puducherry is another amazing option, untouched from hassling tourist activity. 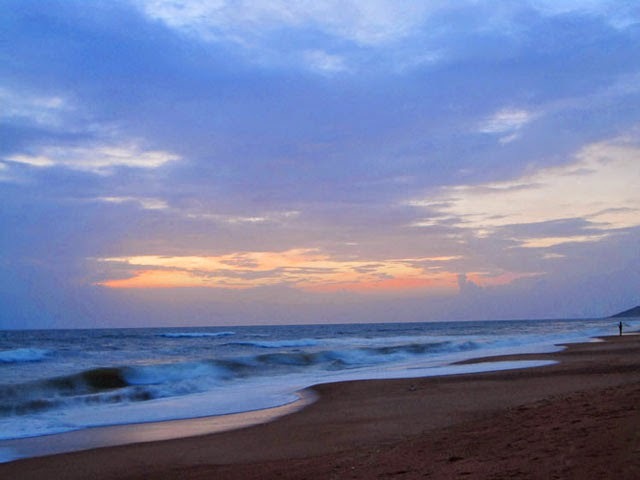 A popular place for honeymoon in India, Pondicherry is home to the very beautiful and peaceful Auroville beach. You can spend some of the most enjoyable and memorable moments of your life here together. Around 12 km from the main city, this beach is offers some very amazing sunset views, that will surely leave you spell-bounded. This beach also consist a 4 m status of Mahatama Gandhi and a War Memorial, built in the memory of soldiers who dies during World War I. Do not miss visiting the French-style architectural marvels in the city. 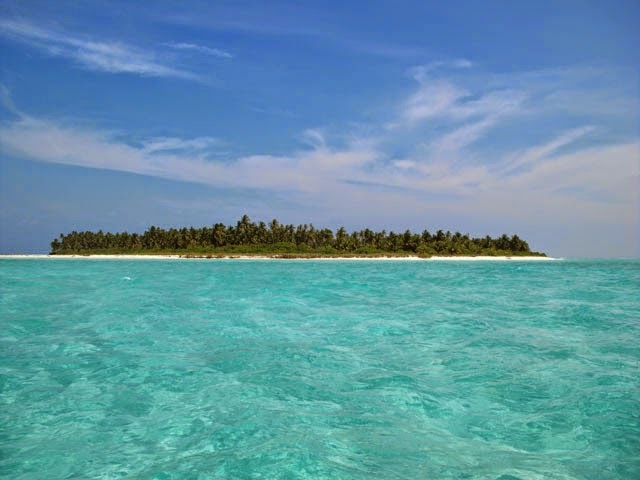 The ever-so-beautiful and pristine Bangaram beach is a part of the Lakshadweep Island. Regarded as one of top 10 mystical beaches, it is best to visit Bangaram during the monsoon rains through a helicopter ride. For an adventure enthusiast couple, there are a number of activities on offering including diving, angling and snorkeling where you can explore the beautiful marine life together. Swaying coconut trees, blue lagoons and exotic coral reefs, cast a magical spell making Bangaram one of the best beaches in India for honeymoon.